One simple fact of life for astronomers is that gas needs to be extremely cold and dense before it can coalesce to form stars. Only under those conditions will the gravitational pull of the star-forming material be stronger than the thermal pressure trying to disrupt the future stars. On the other hand, most of the baryonic (“normal”) matter of the Universe is extremely hot and distributed within groups and clusters of galaxies. Cold dark matter (CDM) cosmology explains that when baryonic matter collapses, it falls into dark matter halos that were able to form at earlier times. When the baryonic matter collides with this envelope of dark matter as it settles into a galaxy or galaxy cluster, it is compressed and heated to the preferred temperature of the dark matter halo, which is quite toasty for large halos. Consequently, astronomers must address the question of how gas settles into galaxies to make as many stars as we see today. In time, shock-heated gas can lose energy by emitting photons through one mechanism or another. However, the hotter the gas, the fewer options it has. At first, the gas can only cool via Bremsstrahlung or “braking radiation”, which is emitted by electrons that lose energy as the pull of nearby protons slows them down. Unfortunately, this process is inefficient, particularly at low densities and high temperatures. As a result, the gas in the outskirts of galaxy clusters and groups can’t cool off substantially during the entire lifetime of the Universe! Individual galaxies fare somewhat better; although large, Milky Way-sized and up galaxies are still thought to be surrounded by a sphere of hot gas now called the corona, much of this gas might cool enough to feed the galaxy over time. While this cooling of gas from the corona may seem great for star formation in some cases, it fails spectacularly for galaxies in the outskirts of groups and clusters. As a satellite galaxy moves through the cluster outskirts (which, remember, are not empty! ), its outer edges will be ripped away in at least one of several ways. 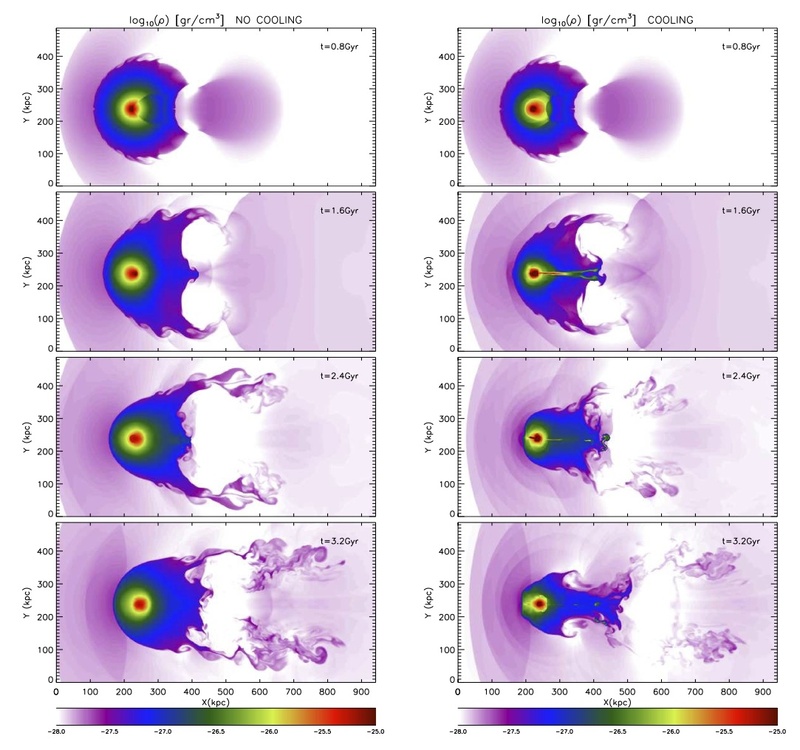 In order for cooling of gas from the corona to be a viable method of obtaining new material for star formation, there obviously needs to be a corona! Consequently, many astronomers assume that such galaxies can no longer form stars, as their fuel has been pulled away by movement through the cluster – a process known as “strangulation“. The authors of this paper suggest that satellite galaxies may not be as cut off as some might think: instead, their simulations show that the cooler, stripped gas from the corona will mix with the surrounding intra-cluster/intra-group medium (ICM) and remain near the original galaxy as a potential new source of star-forming fuel. As previously mentioned, gas can be removed from the outer galaxies in a cluster in three main ways: (1) ram pressure stripping, (2) tidal forces, and (3) Kelvin-Helmholtz instabilities. Ram pressure stripping happens when the pressure of surrounding ICM exceeds the gravitational force holding gas in the galaxy. You can think of it like trying to hold onto something as you stick your hand out of the window of a moving car: if you – the galaxy – don’t hold on tightly enough, the wind you feel because of the motion of your car – the ICM – will blow it away. This mechanism is particularly important in the outskirts of galaxies where the gravitational attraction is weaker, which is what we will consider here, and in the centers of galaxy groups or clusters where the ICM is denser. Tidal forces, a difference in the gravitational attraction to the rest of the cluster across the galaxy, can pull off both dark matter and gas from its near and far edges, similarly to how the Sun causes ocean tides on the Earth. Lastly are Kelvin-Helmholtz instabilities, which show up when two fluids (or gases) attempt slide past each other. Any bumps or wiggles in the interface between the two fluids can grow dramatically, similarly to how wind creates waves on the water. These instabilities can draw the corona out into the ICM and cause the two to mix. Whenever theorists set out to replicate an event seen in nature, they need to choose a method, each of which inevitably has certain weaknesses. For this scenario, most studies so far have used smoothed particle hydrodynamics (SPH), which treats the gas as a collection of particles that can be followed around in space. Unfortunately, while SPH has its advantages, it is terrible at resolving turbulence on small spatial scales (see this astrobite) – which is exactly how Kelvin-Helmholtz instabilities begin. Consequently, these studies have only been able to consider ram pressure stripping and tidal forces, even though Kelvin-Helmholtz mixing acts just as quickly and therefore is equally important. Because the authors set out to investigate where the (relatively) cool gas from the corona goes when it leaves its host galaxy and how much it blends into the ICM, SPH was clearly insufficient. Instead, they use adaptive mesh refinement (AMR), which sets down a fixed grid in space, but makes the grid cells smaller in regions that are more dense, essentially zooming in on the interesting parts of the simulation to successfully capture features produced by turbulence. Figure 1: Snapshots of the simulation with and without cooling. Colors represent the density of the gas on a logarithmic scale, where purple is the least dense (the hottest) and red is the most dense (the coldest). Using the AMR method, the authors set a Milky Way-sized satellite galaxy plunging into a group of galaxies, although in practice, they let the satellite remain stationary and have the ICM wash over it. Figure 1 shows how their simulations evolve. As expected from previous studies, the stripped corona forms a wake behind the satellite, while some of the ICM is also pulled behind the satellite by its gravity. Because even the gas from the corona takes a long time to cool, the simulations with and without cooling included are fairly similar. The key result lies in Figure 2, which shows that the corona and the ICM have mixed behind the satellite. This warm gas is still close to its parent galaxy and will cool much more quickly than the surrounding hot ICM. While this is only a preliminary study, the authors speculate that such a reservoir of warm gas could provide a new avenue for star formation, either within the wake itself or even through accretion back onto the satellite galaxy. If so, the future may be more bright than we once thought for these modest, traveling galaxies. Figure 2: Colors show the origin of the tracer particles: red particles come from the satellite galaxy while black particles come from the ICM.